Three Aberdeen researchers are next week delivering a course that will help arm East European health researchers with some of the skills required to investigate chronic diseases. 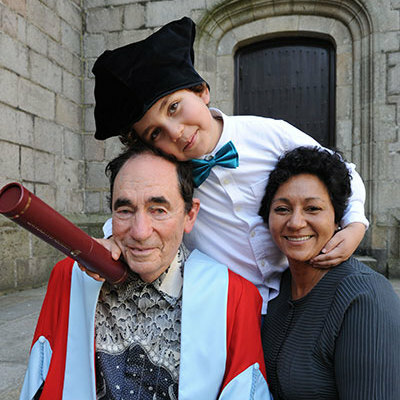 An anti-apartheid activist who lost an arm and was blinded in one eye in 1988 in Mozambique when South African security services planted a bomb in his car is among a host of high-ranking figures being given an honorary degree next week by the University of Aberdeen. A retired medical physicist who has worked at the University of Aberdeen for more than four decades has been recognised for his outstanding contributions to medical science in Scotland. Professor Jennifer Saul from the University of Sheffield will explain unconscious biases and explore their implications at a free University of Aberdeen organised lecture that includes a screening of the film Legally Blonde. The Saltire Foundation, Scotland's world-class business leadership programme, has smashed all previous records by welcoming 104 students to its 2013 Undergraduate Internship Programme. Professor Albert Rodger has been reappointed to the Scottish Further and Higher Education Funding Council. University of Aberdeen student and gymnast Ross Soutar is hoping to keep the sport’s feel good factor going as he puts his studies on hold to target a spot in Scotland’s Commonwealth team for Glasgow 2014. Aberdeen engineering students have completed part of a non-stop 1,700 mile driving challenge across the length of Britain in a bid to be crowned the nation’s most economical drivers. Archaeologists are to dig deeper than ever before at one of the most important Pictish excavation sites ever uncovered. The University of Aberdeen has just installed a new high specification Transmission Electron Microscope (TEM) that will allow researchers to magnify samples up to one million times and also ‘see’ them in 3D. The Sir Duncan Rice Library was named one of the best new buildings in Scotland at the Royal Incorporation of Architects in Scotland (RIAS) 2013 awards last night (Wednesday, June 12). Pupils at a Perthshire school cooked up a visit by a top Scots chef after scooping top place in a University of Aberdeen poster competition. The effects of bus delays caused by bad weather or road accidents could soon be greatly reduced thanks to a new phone app powered by public transport users. Researchers from the Rowett Institute of Nutrition and Health are looking for volunteers to help them discover whether blaeberry extract can reduce sugar intake when taken with a meal and therefore have long term benefits in preventing the development of diabetes. The lessons learnt and how safety priorities have evolved since the Piper Alpha disaster 25 years ago will be discussed at Café Scientifique (Aberdeen City) Wednesday 12 June, Waterstone’s Union Bridge. The science behind evolution of inter-family behaviour, and the lessons we are learning from the animal kingdom on population regulation will be discussed at Café Scientifique (Aberdeenshire) tonight (June 11) at the The Acorn Centre in Inverurie. The University of Aberdeen’s Elphinstone Institute will host its Second Sight and Prophecy conference later this month. Volunteers are being sought for an ambitious new University of Aberdeen study that aims to capture where, when and why we snack and when we spend time being inactive. A new multinational research project launches in Brussels this week to gather and share research on political and social transformations in the Arab world. Her Royal Highness The Duchess of Rothesay will be formally installed as Chancellor of the University of Aberdeen on Monday June 10.